Wall Street bank Lehman Brothers has filed for chapter 11 bankruptcy protection, rival Merrill Lynch has sought refuge by selling itself to Bank of America, and insurance giant AIG needs emergency funding. The collapse of Lehman has triggered turmoil in global financial markets, but the repercussions go much wider. Nobody has a Lehman Brothers cheque book or current account. The company is an investment bank that specialises in big and complex deals and investments. And the dramatic collapse of Lehman Brothers has also shaken the financial markets, with share prices slumping around the world. You will feel the impact even if you are not a banker or shareholder. Your pension fund may have a wobble. Your employer may find it more difficult to do business. And you yourself may have more difficulty getting a personal loan or mortgage. Are any other firms in trouble? Well, for starters there is Merrill Lynch. US authorities and many bankers feared that after Lehman's demise the attention of investors and speculators would have moved to Merrill. The bank hopes to find safety under the roof of banking giant Bank of America. The biggest worry, though, is insurance giant AIG. The company is running out of cash to cover its losses and has asked the government for an emergency bridging loan, reportedly to the tune of $40bn. If AIG is in trouble, it would directly affect millions of consumers and companies around the world. It would also hurt the whole financial system, because AIG is in the centre of a web of complex financial deals. And compared with AIG, the crisis surrounding Lehman is small beer. 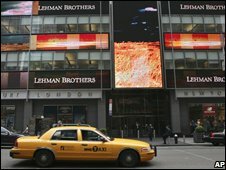 Lehman Brothers was the fourth-largest investment bank in the United States. It was considered one of Wall Street's biggest dealers in fixed-interest trading and was heavily invested in securities linked to the US sub-prime mortgage market. With these investments now shunned as high risk, analysts say it was inevitable that confidence in Lehman Brothers would likely be hit - particularly after the collapse of Bear Stearns earlier this year. In its June to August period last year, the bank said it would make write downs of $700m as it adjusted the value of its investments in residential mortgages and commercial property. One year on this figure soared to $7.8bn, which last week resulted in Lehman reporting the largest net loss in its history. The bank also admitted that it still had $54bn of exposure to hard-to-value mortgage-backed securities. As a result, Lehman saw its share price plummet more than 95%. Despite having access to cash reserves, worried investors pummelled the firm's shares last week after talks to raise billions of dollars from outside investors ran into a brick wall. Why didn't the US Treasury save Lehman Brothers? When Bear Stearns ran into trouble, the US Treasury made the terms favourable for JP Morgan Chase to buy it. And just last week, the US government effectively nationalised Fannie Mae and Freddie Mac, which between them own or guarantee about half of the $12 trillion US mortgage market. How big is Lehman Brothers? Founded in 1850 by three immigrants from Germany, Lehman Brothers has been a prominent investment bank in Wall Street for decades. It operates at a wholesale level, dealing with governments, companies and other financial institutions, employing 25,000 people worldwide, including 5,000 in the UK. Its core business includes buying and selling shares and fixed income assets, trading and research, investment banking, investment management and private equity. As the crisis in financial markets gathered momentum, it saw its share price collapse from $82 to less than $4.